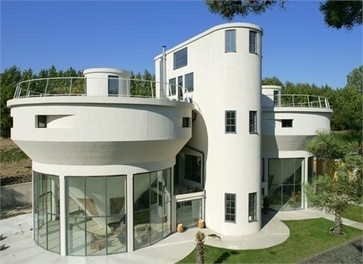 This is a very unusual style of house. The illustrations are the architectural artistic impression of what the finished conversion may look like. How much it will cost to build is up to a quantity surveyor acting for a possible buyer. How much the finished building will be worth is another matter. There can be little doubt that when finished, Infinity House will be unique. 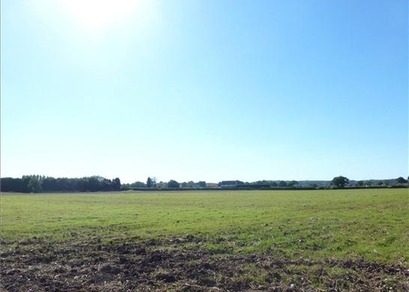 The agents describe this project as a rare development opportunity to build a modern Eco home with wonderful views. Infinity House will occupy a private and secluded position surrounded by green belt in-between the villages of Shenstone and Stonnall. Planning Permission has been granted for conversion of a previous Severn Trent Water Works site to create a unique four bedroom house with ancillary guest accommodation. 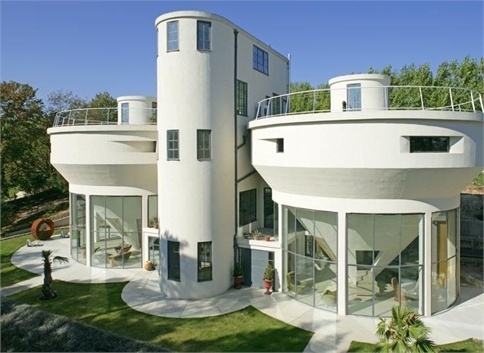 The plans are to convert and link two existing circular concrete tanks to create the main family accommodation. 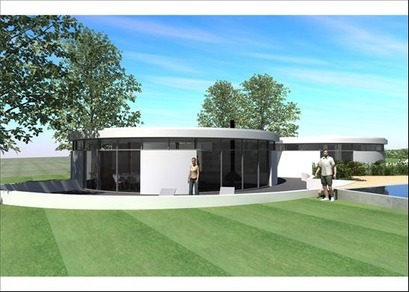 One of the circular structures will comprise of an open plan living space with kitchen and dining area, a study, utility room, guest cloakroom and guest bedroom with en suite bathroom and dressing room. The second circular structure will comprise of the master bedroom with en suite bathroom and dressing room, two further bedrooms and a family bathroom. There will also be access to the integral garage. A further existing single storey building will be converted to an ancillary guest suite and will provide a kitchen, sitting room, bedroom and bathroom. 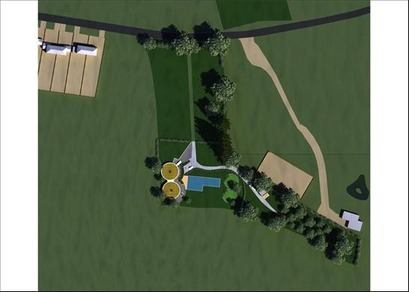 The plot amounts to approximately 2.16 acres and will also include a proposed landscaping scheme. Google Earth – Zoom in to see existing infinity symbol dual-circle existing construction on site .. 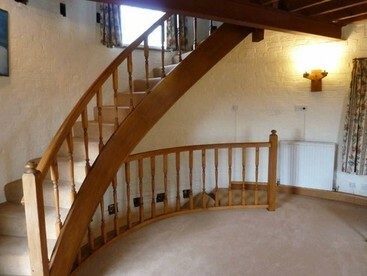 Location: Infinity House, Former Treatment Works, Lynn Lane, Stonnall, Walsall, Staffordshire, WS14 0EP. There seem to be a lot of former windmills with the sails missing. As someone who loves lighthouses, these landlocked ghosts of lighthouses still hold an attraction. Perhaps not for everyone, but if our emails are anything to go by, there are a significant number of readers who are keen to acquire one of these buildings. Doubling as a circular gym, you will save a lot of money on keep-fit classes. Perhaps get a bit dizzy whilst exercising and have one leg bulked with muscle whilst the other is a bit on the slim side. But well worth it for the view from atop! 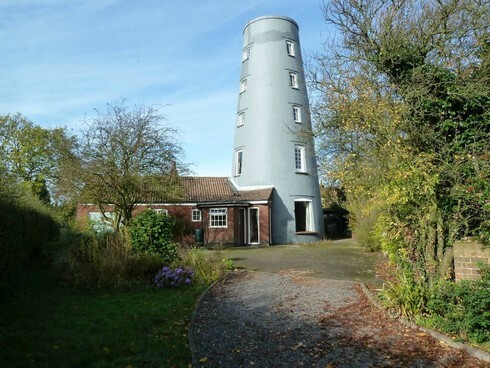 This Grade II listed windmill known as the old Black Giant which has been lovingly converted by the current vendors to create a fantastic family home. Situated on the edge of the sought after Nottinghamshire village of Elston offering breathtaking views as far afield as Belvoir Castle and set on an approximately 0.5 acre plot. Comprising: Gravelled sweeping driveway, entrance porch, reception hallway, kitchen, utility, bathroom, dining room, lounge, three bedrooms, single garage and gardens. 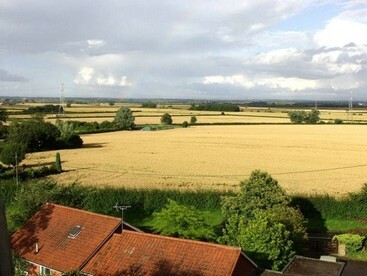 Location: The Old Black Giant Windmill, Mill Road, Elston, Newark, Nottinghamshire, NG23 5NR. Contact Bonfields Agencies Tel: 0115 851 2211. Online Brochure & More Photographs …. By Cue Meadow, Military Road, Rye, we have a section of canal bank as requested by one of our East Sussex readers, with a canal boat needing somewhere berth and own as a home mooring. 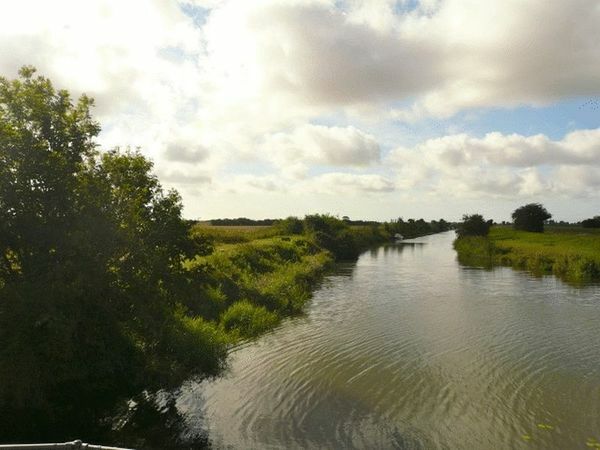 The land is situated where the River Rother meets the Royal Military Canal. Access is off the Military Road to the Appledore side of the bridge over the river Rother. The land is between the Cinque Port of Rye and the Village of Appledore. Measurements of the land are approximately 210′ in length by 70′ in width. These measurements have been given in good faith but are an indication only as the site has not been measured nor surveyed to hyper accurate standards. 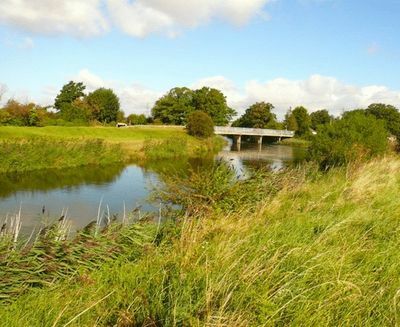 The site benefits from fishing rights to the centre of the River Rother and investigation should be made directly with the Environment Agency regarding boat moorings. The site also benefits from pedestrian and vehicular access. There is a single footpath which runs through the land and it is believed that there may be a water easement also running through the site. The riverbank is laid to grass. Viewing Strictly by appointment with Angela Hirst Chartered Surveyors. Vacant possession. Agents Notes Prospective purchasers are advised to conduct their own investigations through their own solicitors and surveyors. The agency details should be considered only as an indication to assist when deciding whether to view or not. Prospective purchasers are advised to check the boundaries as indicated against the established boundaries on the ground and any official HM Land Registry documents before proceedings. River Bank & Fishing Rights For Sale. Approximately 210′ of River Frontage. Along the River Rother Between Rye and Iden. Location: Royal Military Canal Bank, By Military Road, Rye, East Sussex, TN31 7NY. Contact Angela Hirst Chartered Surveyors Tel: 0845 521 1980. A stately pile-ette. Just big enough not to be too onerous. 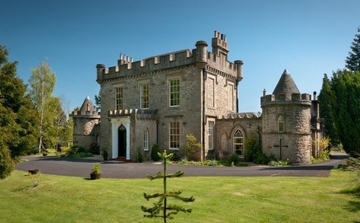 This charming castellated mansion house is Category B Listed. 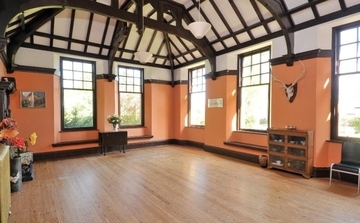 A historic family home with 6 Reception Rooms, 7 Bedrooms (2 En-suite), 4 Bathrooms, a Study & Library. 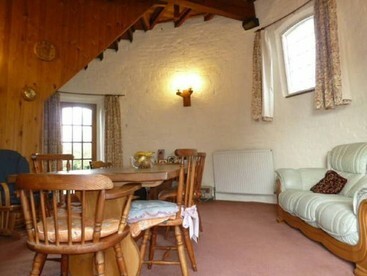 Self Contained Annexe. Mature Garden, Double Garage & Garden Store/Workshop. As has often been said: A Castle for less than the price of a cramped London or Edinburgh Flat”. 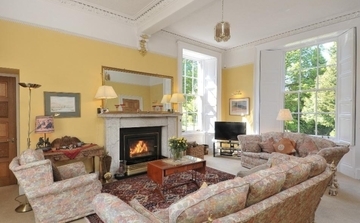 Vellore House is set in over three acres of its own grounds in open countryside close to Linlithgow. The house has a southerly outlook over rolling pasture and there are beautiful views from the grounds to the Firth of Forth and distant Perthshire hills. The property benefits from a situation midway between Edinburgh and Glasgow with good accessibility to both the M8 and M9, giving quick access to both of Scotland’s major cities and also north to Stirling. Edinburgh Airport is only 18 miles away. This splendid mansion house approached by its own tree lined drive. Part of the lands of Muiravonside owned at one time by Alexander MacLeod, aide de camp of Bonnie Prince Charlie. It was extended in the 1780s by a Major Duncan on his return from service in India. Having been besieged in Fort Vellore by Hyder Ali, Major Duncan returned home and set about remodelling the farmhouse to create a replica of Fort Vellore and even included a parade ground (now gone) and the Indian way of dividing fields with mounds of earth topped with trees. The house has a most distinctive and attractive facade with battlements rising above an imposing central section connecting to wings with arched windows, linked by pepper pot turrets to either side. The appearance is completed by the central porch, also with arched windows and battlements. The comparatively modest proportions of the facade conceal the scale of the building behind, with a three storey central section being flanked by single storey wings. Location: Vellore House, Maddiston, Falkirk, FK2 0BN. Contact Savills Tel: 0131 247 3700 – Anna Gardiner. This former chapel has been left at the Altar. Currently unsold and awaiting to be rescued. On 11th December 2012 it failed to sell at auction, and may be sitting on the edge of the ledge for someone to visit and see the potential. Especially as it has an attached cottage, which is a little extra incentive to research into this one if you have a liking for former church buildings. Residential Development Opportunity comprising a Grade II Listed chapel with attached cottage. 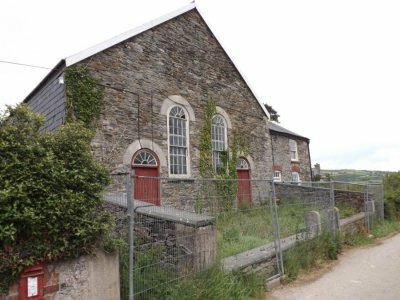 Planning permission and listed building consent was granted by Conwy County Borough Council for the demolition of three sheds, alterations and conversion of the chapel and chapel house to form one dwelling and the erection of garage/workshop. Planning permission was granted on 6th December 2005 under reference 0/30856 and listed building consent was granted on 22nd February 2006 under reference 0/30857. Prospective purchasers must rely on their own enquiries in this respect. In a letter dated 20th September 2012 from Conwy County Borough Council to the vendor they have stated that the information supplied by the vendor appears to constitute a material start and commencement of the approved development. Additional plans have been prepared by the vendor for the conversion of the school house but these have not been submitted to the Council for approval but will be available in the legal pack for inspection prior to the auction. As a post script to this listing, it is important to highlight that most planning permissions are time critical. They last for a specific period then lapse. The writer of this week’s Bulletin has been in this precise position and had a very favourable outcome with a similar situation. If a “material start” can be proven to have commenced within the defined period proscribed in the planning permission, then the permission endures – it does not lapse. Hence the inclusion of the note above that Conwy County Borough Council would at least be aware that a material start may have been made. Of course due diligence and further enquiries/proofs are needed, but it may well be that the 2005 planning permission is still valid. In which case a lot of time and hassle may have been saved. As always, the caveat that prospective buyers must rely on their own enquiries is a cardinal rule. Location: Chapel Ffynnonnau, Llanefydd, Denbigh, Conwy, LL16 5EN. Guide: £170,000 – Failed To Sell At Auction 11-12-2012: Lot 203. Awesome wilderness with renewable energy potential. Auch and Invermearan is situated at the heart of the southern Highlands. 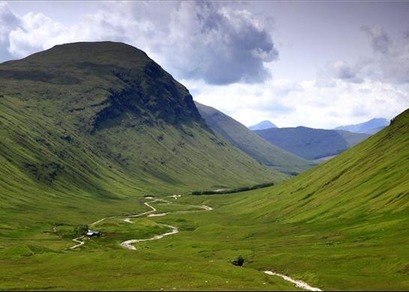 About 28,313 acres in some of Scotland’s most dramatic and beautiful terrain. A first class deer forest with good salmon fishing and renewable energy potential. Auch and Invermearan estate is a large, mixed residential, agricultural and sporting estate extending to about 28,313 acres in total. 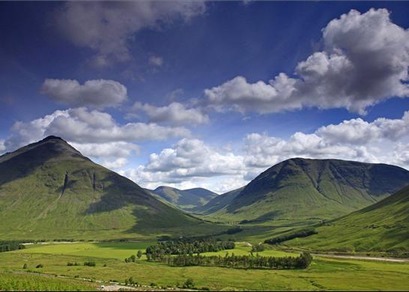 This unique opportunity to purchase a landscape of this scale with such enviable accessibility to the central belt of Scotland to the rest of the UK is extraordinary. 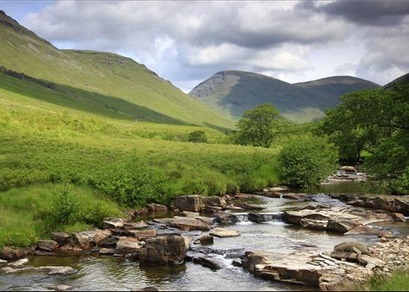 Stretching for a distance of about 12 miles from the east to west boundary and about 5 miles from north to south, the estate lies in both Perthshire and Argyll and incorporates land from which water drains to both the east and west coast. The vast majority of the estate comprises mountainous hill ground, with several mature woodland plantations and new native woodlands. 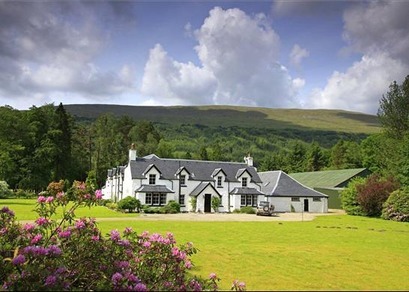 The inbye pasture is situated around the core of the estate and Auch Lodge. 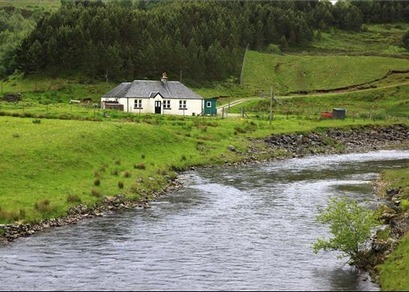 With the residential element and potentially large capacity for hydro/electricity generation, the estate is also managed for sheep production, combined with red deer stalking and tourism. Contact Knight Frank Tel: 0131 222 9600 Ran Morgan, or 0207 861 1064 Clive Hopkins. This former water softening plant is truly unique. The price has recently softened too. Now reduced FROM an eye watering £3,750,000, TO a mouth watering £2,950,000. If you have a serious interest in this utterly amazing place to live, then it is worth noting the online brochure still has the phrase relating to price as “IN THE REGION OF”. Someone is going to have a fantaistic home and at a good price for all the work, effort and imagination that has been invested into this unique structure, which has gone from this…. Official address of this former water softening plant: The Limeworks, Faversham Road, Norton, Kent, ME13 0SE. Further details, narrative, history and photos on our Unique Property Bulletin Archive at …..
Air Fields, Air Control Towers, Aircraft Hulls, Air Raid Shelters, Amazing Spaces, Barns, Bridges, BT Telephone Exchanges, Bunkers, Canals, Canal Boats, Castles, Caves, Churches, Cinemas, Coastguard Towers, Community Dwellings, Container Houses, Customs Houses, Dams, Distilleries, Earth Dwellings, Engine Houses, Fire Stations, Foghorn Buildings, Gasometers, Harbours (For Ships), Helicopter Houses, Hobbit Houses, Hospital Buildings, Hotel Buildings, Ice Houses, Infinite Spaces, Islands – Private, Islands – Small Community, Jails, Keepers’ Houses, Libraries, Lifeboat Stations, Lighthouses, Lodges, Lookout Defences, Loos, Martello Towers, Ministry of Defence Buildings, Movie Sets, Multi Storey Carparks, Nuclear Bunkers, Oil Rig Modules, Orangeries, Police Stations, Post Offices, Printing Works, Pubs, Pump Houses, Queen’s House, Railway Carriages, Railway Stations, Rocket Stations, Schools, Shipping Container Houses, Ships, Ship Hulls Landbased, Signal Boxes, Steam Houses, Stately Homes, Subterranean Dwellings, Sustainable Homes, Tide Mills, Toll Houses, Tunnels, Underground Railway Carriages, Underground Stations, Unusual Eccentrics, Valve Houses, Vicarages, Walled Gardens, Warehouses, Water Towers, Water Treatment Works, Water Works, Weird Buildings, Wild Cards, Winch Houses, Windmills, Wind Turbines, X Factor, Yachts, Zoos.